Comparing dividend stocks by sector is an important step in my stock selection process. As your portfolio grows, you should have more than one dividend stock per sector to limit your exposure. As you get ready to invest more money either from dividends or from new money, which sector do you add to or which stock? It’s entirely possible that one of your holdings is underperforming and you want a replacement. It happens. Understanding your options by sector is a diligent and smart investing approach. Sector classification is driven by a set of standards across North America, stock market and indexes. There is a specific company classification referred to as NAICS (North American Industry Classification System) managing a set of classifications. Statistic Canada is also a partner with defining the NAICS with company counts for different classifications. While the company classification is critical to understand the evolution of industries, it is by far too detailed to manage for investors and all companies can be grouped under a sector. The best visual tree I could find is under Wikipedia's Global Industry Classification Standard. Dividend Achiever: A stock that has increased its dividend for 10 consecutive years. Dividend Aristocrat: A stock that has increased its dividend for 25 consecutive years. Dividend King: A stock that has increased its dividend for 50 consecutive years. As you probably know, a longer streak doesn’t mean a better stock. There are many more criteria that must be evaluated but what a long streak tells us is the commitment to shareholder value the company has and its ability to manage the company’s cash. There many more industrial stocks but the list below is a good start to find an industrial holding for your portfolio. 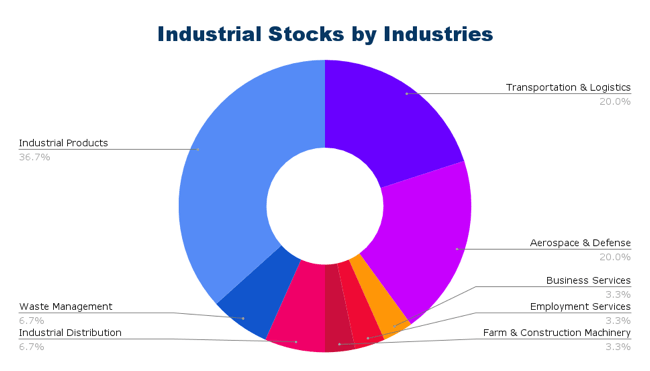 While they are all industrial stocks, understanding the industry they operate in can be useful as you may not have an affinity for the industry and not all industry perform the same. It may also be useful to compare by industries in some cases as opposed to the sector alone. The industrial products has some really large conglomerates with a good number of dividend aristocrats. This industry should get your attention for the industrial sector. The transportation is a solid industry with some oligopoly business in the mix. I find it to be another strong industry with dividend growth potential. This is the industry to invest in if you want to profit from the government spending in defense. It may be important to monitor the spending targets from the government to establish the your intended exposure and keep up with the elections. A dependable industry and a necessary one as it tends to resolve problems outside of the core business of other companies. Another dependable industry and a necessary one to supply corporations with flexible manpower. It is however tied to the economy and something to be aware of. Farming is a necessity that will continue to require needs and so will constructions even if just for maintenance over many years. Another industry dependent on the core industries generating products and needing parts. Maintenance and supply will still be needed and in place which means the economy could have less of an impact on this industry. An industry that’s almost a necessity. It doesn’t fall in the food, shelter and safety category but like utilities, it’s a by-product necessity of the develop world. In my book, that makes it a dependable industry with growth while somewhat regulated. An interesting industry to have in the industrial sector as travel is almost tied to consumer cyclical where the travel industry included. It’s probably no surprise that you don’t see any stocks from this industry in the top 30 selected industrial dividend stocks. You probably noticed that I favor some industries over others. With that said, here are the stocks on my short list based on my dividend growth investing rules. Railway is an oligopoly and a necessity to move our goods.